The Brexit referendum in June of 2016 sent shockwaves across the world. The doomsday forecasts dominated headlines with predictions of an inevitable economic catastrophe whose onset some today are still expecting. But if many were and are worried, you may not see it from taking a walk around East London’s stunning Silicon Roundabout, the beating heart of the UK tech scene. For the Roundabout’s 50,000 digital tech employees, 30 accelerators, and over 2000 startups, it’s just business as usual these days. And the tech business in London over nearly the last decade has been very good. Several months ago I was fortunate to spend a week in London. Eager to get a sense for the state of things, I was looking for symptoms of distress. But in many ways what I found was the opposite. With at least another year of Brexit trade negotiations awaiting, the digital economy in Europe’s startup capital is moving ahead, growing twice as fast as the wider economy and boasting a yearly output of $138 billion. In 2017, venture capital investment in the UK reached an all-time high of $4.14 billion, totaling more investment for Europe’s long-time fundraising leader than that raised in Germany, Spain, France, and Ireland combined. Meanwhile, the latter half of 2017 saw Amazon and Facebook announce plans to expand operations in the UK capital. In other words, the tech scene in one of the world’s greatest cities is far from at the point of crisis. Indeed, from what I could tell, it looks to be thriving – and if some anticipated a decline, there are many today predicting the moment when London surpasses New York as the world’s second most important tech center behind Silicon Valley. Even still, the uncertainty has as of late cast a shadow over London’s incredibly promising tech ecosystem. For that there’s good reason to take a look at what is keeping so many business leaders and industry experts optimistic. And even though when it comes to London there’s always an endless number of things to mention, here are a few that will stand out to those not lucky enough to know this city firsthand. The reason why we’re still hearing good news from the UK’s digital industry in the wake of the Brexit vote is easier to comprehend once you understand that today’s flourishing tech scene itself took off in the midst of calamity. The economic recession of 2008-09 left London reeling. It also saw thousands of professionals from the creative industries forced to try their hand on the city’s nascent tech scene. From out of the economic tumult, a small cluster of internet startups – including Last.fm, TweetDeck, and AMEE – sprang up around East London’s Old Street Roundabout, in part due to lower recession-era rent prices in the area. Seedcamp, led by Reshma Sohoni who later provided the idea for the Entrepreneur Visa, was started the prior year and was the first to start pre-seed investing. By 2010, the tech industry, sparked by activity in the Old Street Roundabout, was the only UK industry not in decline, and Prime Minister David Cameron’s government stepped in to fan the flames. They introduced Exceptional Talent Visas to lure digital talent from across the world. They initiated the Enterprise Investment Scheme (EIS) and the Seed Enterprise Investment Scheme (SEIS), allowing businesses to write off angel investments for tax purposes and laying the foundation for an investment community that today is unrivaled in Europe. They also started the Tech City initiative, an effort to accelerate growth around the Old Street Roundabout, which would itself soon come to be called ‘East London Tech City,’ or ‘Silicon Roundabout.’ The government invested around $69 million in Tech City, hoping to attract large American companies such as Cisco, Intel, Facebook, and Google. The initiatives had great success, drawing investment from American tech giants while helping the number of startups in the area to more than double, from 85 in 2010 to 200 in 2011. Tech investors and accelerators like startupbootcamp, led by Andy Shannon and Wayra arrived on the scene to help guide and grow the multitudes of new tech businesses. And then Google came to town. In September of 2011, Google acquired a seven-story building in Silicon Roundabout, opening the doors to its Campus London community hub and coworking space in 2012. 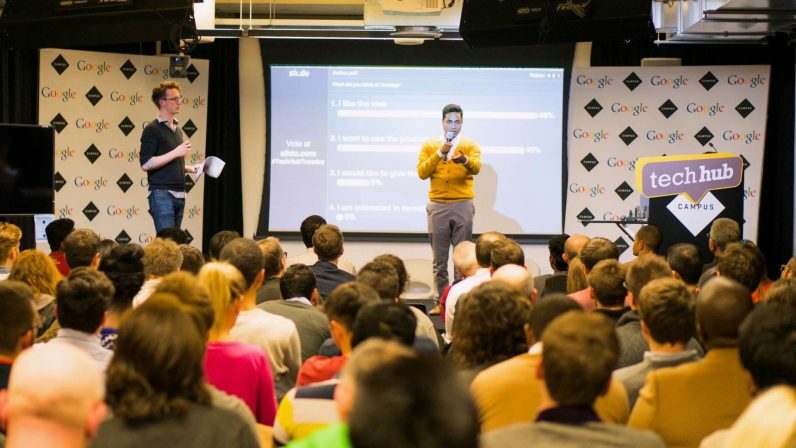 Hosting a range of activities, from speaker series and hackathons to training workshops and product demonstrations, Campus London had 22,000 members less than two years in – it has since helped raise millions in investment for its members, and created thousands of jobs. With Google’s arrival, London’s tech scene really took off. Soon other tech giants followed, among them Apple and Facebook. Spotify and Skype also opened London headquarters. The big tech companies helped inspire local entrepreneurs to think big, and the smaller startups reminded their industry giant neighbors how to stay nimble. And the synergy of the Tech City neighborhood, stimulated by a plethora of VC funding, tech accelerators, and government initiatives, quickly transformed London’s technology sector into an ecosystem that could truly give Silicon Valley a run for its money. From 2010 to 2015, turnover in the UK digital tech industries grew by a rate of 22 percent; in that same period London-based technology companies raised a total of $5.2 billion in venture capital funding. Take a walk around Old Street Roundabout today and the energy is palpable. With trendy pubs and cafes, vibrant art galleries, and jaw-dropping graffiti, it exudes style, and inspires creativity. Today, Tech City is a playground for innovators of all types, from artists to entrepreneurs. And it is home to tech giants and startups of all kinds. In the past few years this spirit of innovation has spilled over into each of London’s boroughs, with startups now active all over the city. It has been the fintech capital of the world for quite some time, but now also boasts top startups from the edtech, adtech, proptech, health tech, as well as media and entertainment industries. The city produces more unicorns than any other European city, with Shazam, Improbable, Benevolent.ai, and TransferWise currently highlighting that list. The circumstances of the 2008-09 recession in many ways produced a perfect storm for innovation. And the reason London’s ecosystem still shows so much promise is that these same forces remain strong – they helped build a flexible, resilient ecosystem that’s rich in resources and can thus thrive in the face of adversity. For one, the government continues to help tech companies, supporting them with everything from R&D tax credits to visa schemes for digital innovation experts. It can cost you as little as $275 to start a business in the UK, as compared to costs exceeding $10,000 in other countries. Entrepreneurs can also count on a plethora of crowdfunding companies, global VCs, angel investors, mid-sized and large investment companies, and private investment opportunities. They’ll find accelerators like TechStars and Seedcamp – that’s raised $1 billion in follow-on funding to date – and incubators like Wayra UK – which has raised $160 million in third-party funding since 2012 – as well as spaces like TechHub, which runs many local events each week and is led by CEO Elizabeth Yarley and COO Andrew Tibbitts, Rainmaking Colab with its Head of Ecosystem and Marketing Triin Linamagi, Impact Hub Westminster, Forge & Co, Central Working, Huckletree and Campus London. I was told that Startup Grind, led by Europe Director Marian Gazdik, is one of the city’s most popular events, as well as the conference The Europas, led by Mike Butcher. Increasingly organizations based in Europe and outside are choosing to host their events in London to maximize visibility, and to catch the eyes of foreign investors. For example, Polish startup organization PLUG will hold its Polish Tech Day at Google’s London headquarters on June 20th, and Women Startup Competition, originally founded in Hungary, will host its final featuring female led startups from all over Europe on September 15th. It’s not just London, however. There’s fertile ground for startup activity all over the UK. Regional tech hubs have emerged across the country, specializing in everything from cyber security to digital media – and in 2016, these regional clusters attracted more than $6.2 billion in digital tech investment. We’d be remiss not to mention a few. Start with Manchester, where a vibrant digital tech economy employs over 62,000 people, hosts a number of tech conferences, and attracted nearly $108 million in investment in 2016. To the north, Edinburgh is the UK’s second-largest financial center, a health tech hub, and home to unicorns like Skyscanner and FanDuel. Newcastle has given birth to 211 startups and some of the UK’s biggest digital tech businesses, including Sage. It’s also the location of the Ignite accelerator – the UK’s best outside of London. Gaming, virtual reality, and digital agencies are flourishing in Liverpool, while Cambridge probably boasts the country’s most mature tech ecosystem. With a world-class university producing top-tier talent, the city has produced some of the UK’s most successful companies, including chipmaker ARM. The university also has the popular Cambridge University Entrepreneurs group, which since 1999 has awarded over 600,000 Euro in prize money to more than 60 start-ups. In Leeds, a number of promising startups are emerging, including Cocoon and Ten10. Meanwhile, Brighton stands out for its digital advertising and marketing agencies, as well as design and gaming studios. Rounding out the list is AI heavyweight Glasgow. In Scotland’s largest city startups from a wide range of digital tech sectors are also supported by meet-ups like Glasgow PHP and accelerators such as RookieOven. As the UK continues to renegotiate its relationship with Europe, the main anxieties have centered on how Brexit could limit access to EU talent and the possibility of investors opting to refocus on EU businesses with guaranteed access to the European market. But though Brexit will surely present its share of challenges, signs thus far indicate that fears are inflated. As we’ve scene, the London and UK digital economy has the assets to stay strong. And even to grow stronger. A recent study by Tech City showed that the majority of tech workers migrating to the UK aren’t coming from the EU, but rather from India, Australia, and the US. And if this is the main source of the UK’s imported talent, the government is aiming to keep it that way by recently boosting the number of special visas available to non-EU tech workers. Fundraising dollars, meanwhile, are no more likely to dry up than talent. After a wave of successful IPOs, Britain’s first-generation entrepreneurs are now looking to invest. This sort of recycling of capital is something that has been integral to Silicon Valley’s continued supremacy. With the end of one cycle and the beginning of another, both capital and know-how are now flowing back into the startup ecosystem, promising to keep it healthy. Gloomy forecasts, then, don’t account for the myriad strengths underlying the London and UK tech scene. Far from any doomsday scenario, the UK and its capital continue to further cement their place as world leaders in tech entrepreneurship and innovation.